The unique “A” Frame one bedroom bungalows and The Shack on the foreshore are spacious and perfect for couples, while the two and three bedroom units on the foreshore and around the hillside will accommodate a family or two without getting in each other’s way! By the Lake Motel Units are located in a quiet part of the property overlooking a man made lake, each unit has a tranquil view of water and gum trees, and various decks from which to enjoy the ambience. The 19 separate timber bungalows are have their own kitchen, bathroom, separate bedrooms and lounge room. Each one has its own driveway into its own attached covered carport. Each one has its own private deck off the lounge and main bedroom. Each one is independent of the others. 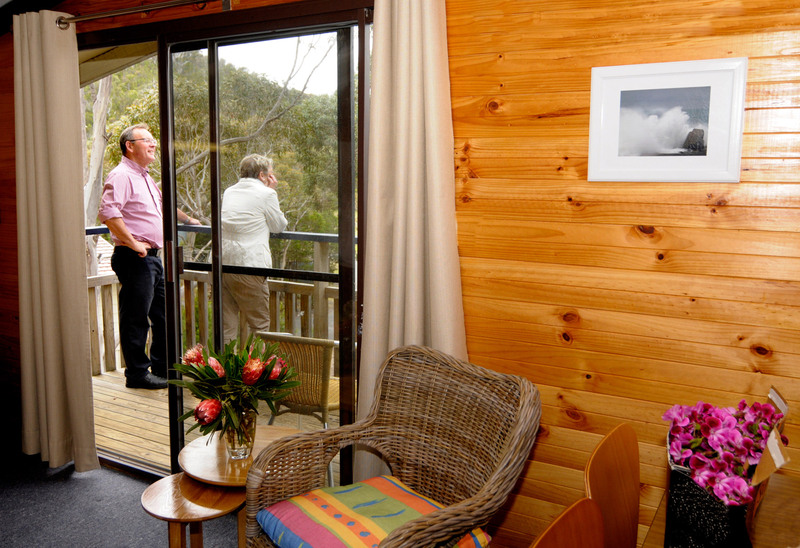 Scattered over 8 acres, each bungalow is surrounded by gum trees and natural vegetation. The four bedroom unit will sleep 9 – great for a couple of families or a group of friends. The main bedroom has a queen bed, while the other bedrooms mostly have single beds. All the beds are made up with sheets, electric blankets, doonas and pillows. The bathrooms each have a bath and shower, vanity and separate toilet. Each unit has a hair dryer. There are lots of hooks and rails for your convenience! Most are ground level, although a couple have stairs. Carpeted floors, heater, lounge chairs, couch or divan, television and DVD make for a comfortable lounge area, while the kitchens are complete with microwave oven and conventional oven, refrigerator, cooking utensils, cutlery and crockery. Dining table and sufficient chairs for all guests complete the common areas. All with unusual (and a few quirky) names, each bungalow is fully furnished and fully equipped for cooking. An outstanding view is one thing, but for a motel to gain street “cred”, you must get a truly great sleep. To this end, each unit has a new Sleepmaker queen size bed, electric blanket, quality linen and pillows, and a reverse cycle air conditioner. Flat screen TV and DVD player, private deck, spacious modern bathroom with a shower, will all help you to relax and refresh ready for another day. 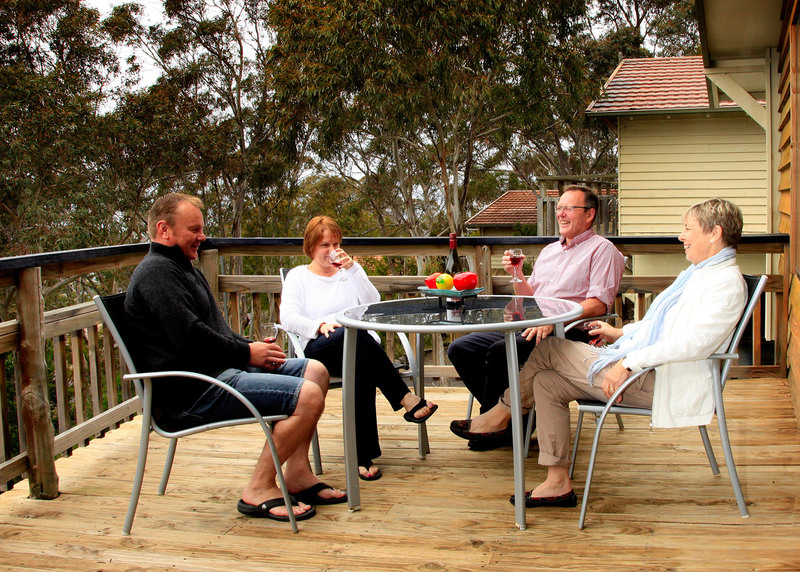 Enjoy the privacy of your own deck, or if travelling in a group, why not get together on the communal lower deck.